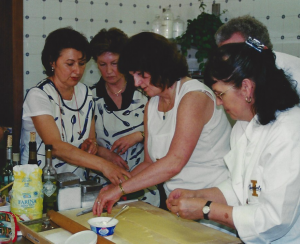 A few years ago, I traveled on a cooking tour of Italy and learned how to make authentic dishes with acclaimed Chefs Antonia and Giulianna at the Villa Serego Alighieri near Verona. The property, surrounded by vineyards, olive trees, and fruit orchards, has been in the family of the great Italian poet Dante Alighieri (Dante’s Inferno) since the year 1353. This week, I learned how to make sand pies from chef Baby Boo in her parent’s back yard surrounded by a tree fort, miscellaneous mismatched shoes, and assorted toys. She has inspired creative recipes since 2012. I treasured both experiences, but I must admit that the concoction presented by Baby Boo was less fattening and easier to fix than the elaborate Tuscan Cappelletti we made with fresh pasta, artisan cheeses, and red sauce that required several hours to prepare. The distinct advantage of the Italian cuisine is that the meal was paired with a luscious Amarone wine. 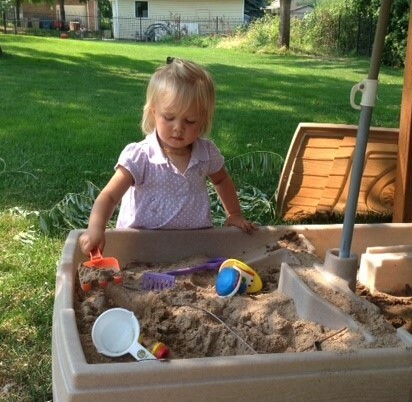 The sandbox pies only need water and a towel. And, my son and daughter-in-law gently suggest I forgo wine while I’m tending their precious daughter. Watching my wee granddaughters at play brings moments of delight just as enjoyable as a grand feast on a linen-covered table set in a European orchard. The little girls continually erupt with laughter as they create spontaneous inventions: a large scarf becomes a baby carrier for a stuffed owl, a wooden fort transforms into a sailboat navigating the open sea, and a sprinkler on top of a sheet of plastic causes a giggle-factory. Rumor has it that Tutu (the name they call me) is good for telling tale tales and bringing real cookies, so I’m included in the fun. The little girls enjoyed this summer outside – camping in the Idaho Mountains, splashing on the Oregon Coast, and boating on an alpine lake. They brought along their parents just to drive and pay for everything. The girls also know how to do a Google search to download an app and store it in their personal folder on my cell phone, but they are just as happy exploring the world without electronics. For that, I am grateful. On another cooking tour to South Africa, I learned how to use exotics spices to duplicate the rich and flavorful food of Cape Town with Chef Cass Abrahams. She taught the value of fresh herbs and spices, including cinnamon, garlic, cloves, cardamom, nutmeg, fennel, mustard seed, saffron, turmeric, curry, and ginger root. My granddaughters are just as dedicated with their creations and prefer to mix light sand with dirt, pebbles, twigs, stray bugs, and water from the hose to form a paste that is almost impossible to remove from under their fingernails. But, their devotion to their art is just as serious as that of the grand chefs mastering their cultural cuisine. I can only smile with gratitude when handed either a grilled kebab marinated in garlic and chutney sauce or a sloppy mud pie. The vibrant chefs I’ve met love to cook, and their exquisite recipes are their gifts to the community and to the world. They celebrate the noble feast and know that life is better when breaking bread with friends. My granddaughters have taught me the simple pleasure of making sandbox pies and mud cakes. They, too, share an exuberant appreciation for creative play and wholesome activity. They nourish my soul. Love it. Just make sure you don’t mix up which one to eat, but everything tastes best when made with love, right? Mangia! Mud pies! One of the true joys of childhood! That and wearing your mother’s hat and shoes.